Are you enjoying the full benefits to be gained by braising food? The option to braise meat and poultry rather than using other cooking techniques is probably not one you took lightly. Heck, a lot of people couldn’t tell you the difference between braising food or deep-frying it. Clearly a huge difference exists. But you may still only know half the story if you are trained in the art of getting the most from the choice of braising food rather than frying, roasting, broiling or grilling it. Braising is the art of being able to cook slowly without adding much–or, for some, any–liquids to help the process along. 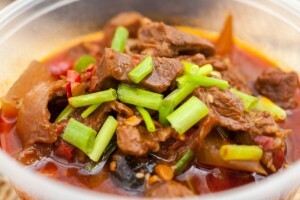 You would not typically choose to braise foods that would not benefit from the process of a long cooking time. Meaning that braising should usually be reserved for the toughest cuts of meat. The greatest threat to getting the most out of braising food is allowing the process to turn into steaming food. Steaming cubed pork, game birds and spareribs probably tastes as appetizing as it sounds. You set out to braise that meat, then you braising is what you should do. What Specific Cuts of Meat are Best for Braising? Because of the long cooking time under low heat, if you were to start with a piece of beef already tender, by the time the braising process was completed, you might not even have something still recognizable as cut of meat. Instead, reserve the choice for braising food to meals centered around the meats mentioned above as well as pot roast, lamb shoulder and short ribs. Can You Really Braise Food without Adding Liquid? Not only is braising food without adding liquid possible, it is mandatory for getting the most from this cooking process. Optimal taste for braising food is gained by initiating the process by sauteing the meat in fat until browning has occurred. This part of the procedure can be done over slightly higher heat than the rest. Just make sure not to crowd the pan with an overflow of meat as this could and probably will lead to steaming. And remember what we said about braising food? It is NOT steaming food. If done correctly, the rendered fat will provide most of the juices needed to get the meat properly braised. Very minimal amounts of broth or water or wine can be added after browning although more flavor is to be had from braising food directly on a bed of the same vegetables you would use for stew or pot roasts. Is There a Secret to Retaining the Natural Juices of the Meat? And here is where you may find the most important information required for getting the most out of braising food. The ideal process of braising foods will be one that has concentrated the natural juices as a means of creating deeply flavorful meat while also avoiding the problem braised food becoming steamed food by having added too much liquid. Both these elements of making braising food turn out ideal can be accomplished with the little trick of placing a buttered circle of parchment paper between the lid of the pot and food inside throughout the cooking procedure. Please do not hesitate to contact us if you have any further questions about braising or any other method of warming food.